You’ve got to hand it to Hyundai for the way it created its new Elantra Sport model. It put some effort into the job. Yes, the Elantra has the kinds of things that commonly go into economy sedans that count “Sport” or “GT” versions among their offerings. There’s a black-highlighted grille, low-profile tires on distinct 18-inch alloy wheels, metal-face pedals, a leather-wrapped flat-bottom steering wheel, turbocharged engine, and “sport-tuned” suspension. Hyundai went a little deeper to make this Sport, however. The torsion-beam rear axle found in other Elantras was yanked out in favor of an independent multilink rear suspension. The Sport is the only member of the family with a rear stabilizer bar, and its front disc-brakes rotors are larger than those of other Elantras. The Elantra Sport gets unique front and rear fasciae; the rear fascia includes dual exhaust outlets and a diffuser element. Also standard are LED taillights and daytime running lights. The result is a compact that will take you anywhere pleasantly, except the poorhouse. The turbo 4-cylinder engine delivers good regular-gas fuel economy in an uplevel model that still starts at just $21,650 with a 6-speed manual transmission or $22,750 with a 7-speed dual-clutch automated-manual transmission. The Sport is new to the Elantra sedan line, which is redesigned for 2017. (The Elantra GT hatchback is still based on the previous design, but will catch up for ’18.) The Sport is the new power leader, with 201 horsepower and 195 lb-ft of torque from its 1.6-liter engine. 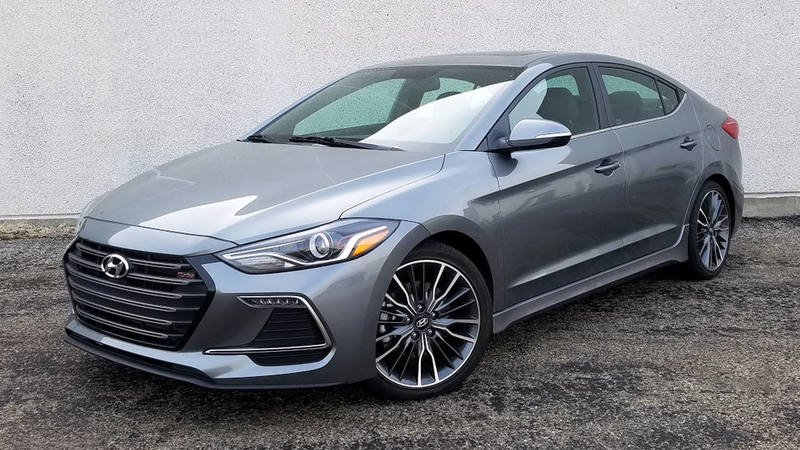 That’s a considerable 54-horsepower increase over the naturally aspirated 2.0-liter four in the Elantra Limited that Consumer Guide® tested previously. In terms of both design and materials, the basic Elantra interior is a bit underwhelming, but the Sport’s upgrades do a good job of adding character and class. We were especially fond of the flat-bottomed steering wheel, the red contrast stitching, and the comfortable-yet-supportive front bucket seats. CG’s automatic-equipped Sport tester was snappy off the line and not noticeably hampered by turbo lag. A couple of times in expressway cruising, when this driver tried going from “fast” to “faster,” the trans took its sweet time before downshifting but generally seemed to complement the engine nicely. A “Drive Mode Select” feature adjusts throttle response and steering effort but switching to “Sport” mode in place of the default “Normal” setting rendered only minor changes in acceleration. Increasing speed is accompanied by an exhaust note that’s not as nice as a sporting purr but not as off-putting as a roar or groan. You really can’t ignore it but it never really rises to the level of being unpleasant. This driver put 178.9 miles on the Elantra Sport, averaging 25.8 mpg with 65 percent city-style driving. That’s close to the EPA estimate of 26 mpg in city driving. (The highway projection is 33 mpg.) Note that the automatic-trans Sport has better EPA ratings than the manual-transmission version. The Elantra sedan’s trunk offers good cargo space, an unobstructed load floor, and pull handles that allow you to fold the rear seatbacks from the rear of the vehicle. Though handling is not premium-sport-sedan sharp, it‘s quite good for the class. Sport mode does for steering what it does for engine performance: improve it slightly, but improve it nonetheless. The really nice surprise is that ride quality holds up well. 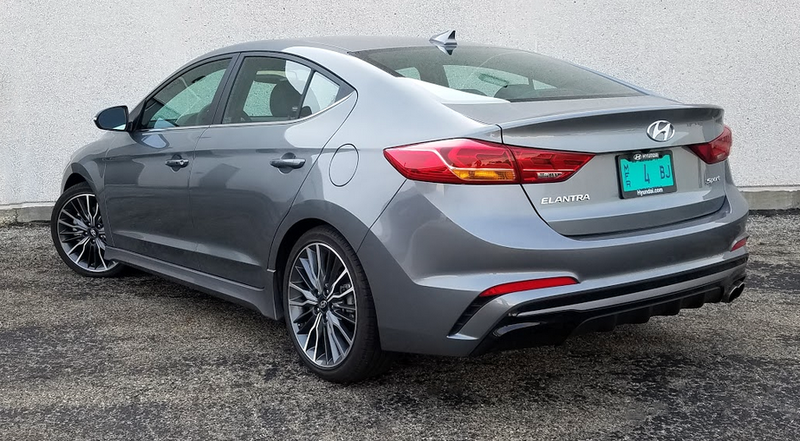 In fact, bump absorption was better managed in the Elantra than in the Mercedes-Benz CLA250 that this reviewer had driven right before getting into the Hyundai. As for braking, the Elantra Sport stopped securely without nosedive. Despite the few distinct tricks it has up its sleeve, the Sport is still an Elantra at its core. Front passenger space is good, and thin roof pillars open up pretty good all-around driver vision. The rear seat can be cramped for legroom if tall occupants are riding up front but headroom and rear seat comfort will please most passengers. However, comfortable 3-across seating for adults is probably out of the question. Cabin stowage for incidentals is managed by a big glove box, a small but deep console box that doubles as an armrest, a covered bin with auxiliary/USB ports and two 12-volt plugs at the front of the console, and a net pouch on the back of the front-passenger seat. All doors have pockets with bottle holders, and there are twin exposed cup holders in the console and in the pull-down center-rear armrest. The wide, flat trunk floor provides good cargo space for a compact. 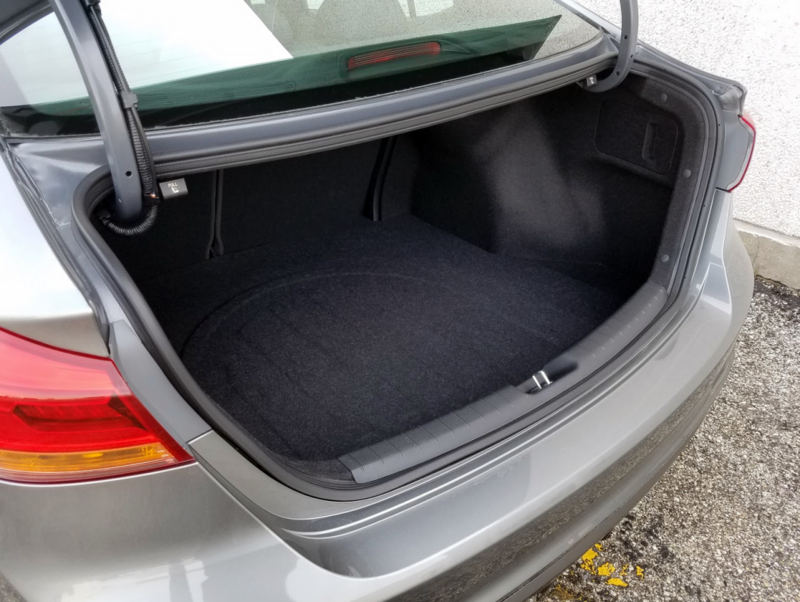 Pulls in the trunk release the 60/40-split rear seats to fold for added carrying capacity. However, the retracted seats rest a few inches above the cargo-floor level, which may complicate loading of some items, and a bulkhead behind the seats narrows the threshold between trunk and cabin. 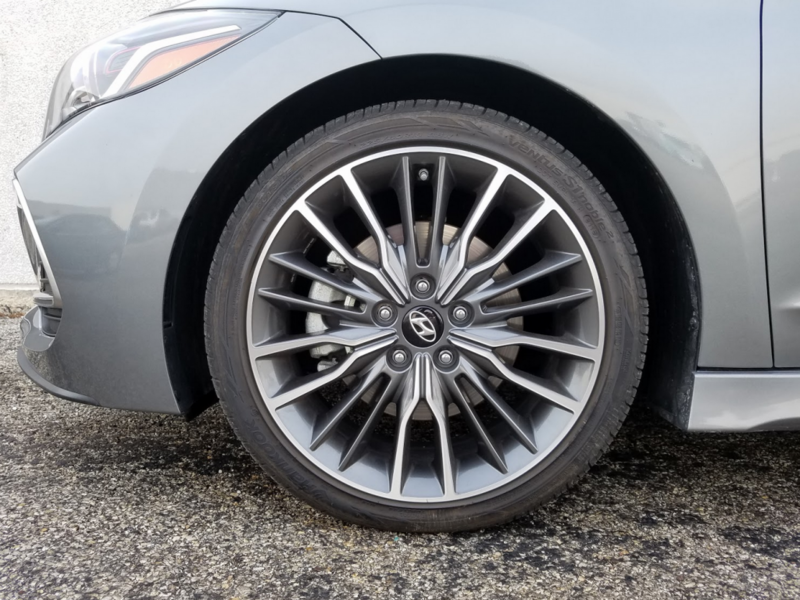 Eighteen-inch alloy wheels on low-profile 225/40 R18 tires are standard. In addition to the racing-style steering wheel, the Sport interior includes comfortable and nicely supportive sport bucket seats clad in black leather with red contrast stitching. There’s a special black headliner above, and speedometer and tachometer dials bear red indicator needles that other Elantras don’t have. Textured black dash trim completes the Sport’s distinctive look. Still, even as one of the better-endowed members of the family, it isn’t really overly plush. For instance, soft-touch surfaces are limited to the door centers, armrests, and console-box lid. Audio systems have convenient volume and tuning knobs, which make selecting and saving station presets a snap—even on the optional upgraded sound system that was in the test car. Similarly straightforward are the climate controls, with dials to set temperature and clearly marked buttons to operate other functions. The Elantra Sport is pretty well equipped aside from its model-specific features. 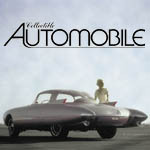 Other key standards are LED taillights and daytime running lights, high-intensity-discharge headlights, hands-free “smart trunk” that opens when the keyholder stands behind the car, side-mirror turn-signal indicators, door-handle approach lights, 3.5-inch thin-film transistor (TFT) information display in the instrument cluster, seven-inch color touchscreen display audio system, satellite radio, Android Auto and Apple CarPlay connectivity, smartphone/USB and auxiliary-input jacks, two charging USB ports, a rearview camera, heated front seats, push-button starting, and remote keyless entry. There’s just one option group for the Sport. The Premium Package tacks on a navigation system with an 8-inch touchscreen, enhanced Infinity 8-speaker audio system, Blue Link telematics, power sunroof, dual-zone automatic climate control, blind-spot detection with rear cross-traffic alert, and an auto-dimming rearview mirror. With this $2400 bundle, carpeted floor mats, and delivery factored in, the test car came to $26,110. Even “splurging” on an Elantra Sport remains in the realm of the believable, which is probably something else for which Hyundai ought to get credit. While not as entertaining to drive as a Volkswagen GTI, the Elantra Sport deserves to be mentioned in the same conversation. The Sport looks and feels the part of a true sporty compact, with confident handling, quick throttle response, and a general sense of composure. The real news here is that this sported-up Elantra is fairly priced and surprisingly fuel-efficient considering the power on tap. Young drivers looking for a ride that is both responsible and rewarding should put the Sport on their test-drive list. In addition to the unique front and rear fasciae, body side sill extensions help make the Sport look the part. Written by: The Daily Drive staff on March 17, 2017.on February 28, 2018.